SmartThings' name-brand flood detector is short on useful features, but it's inexpensive and plays nicely with other devices and services. When shopping for a smart water leak sensor, you can either pay more for lots of extra features, or opt for a basic device that simply sends alerts to your phone. 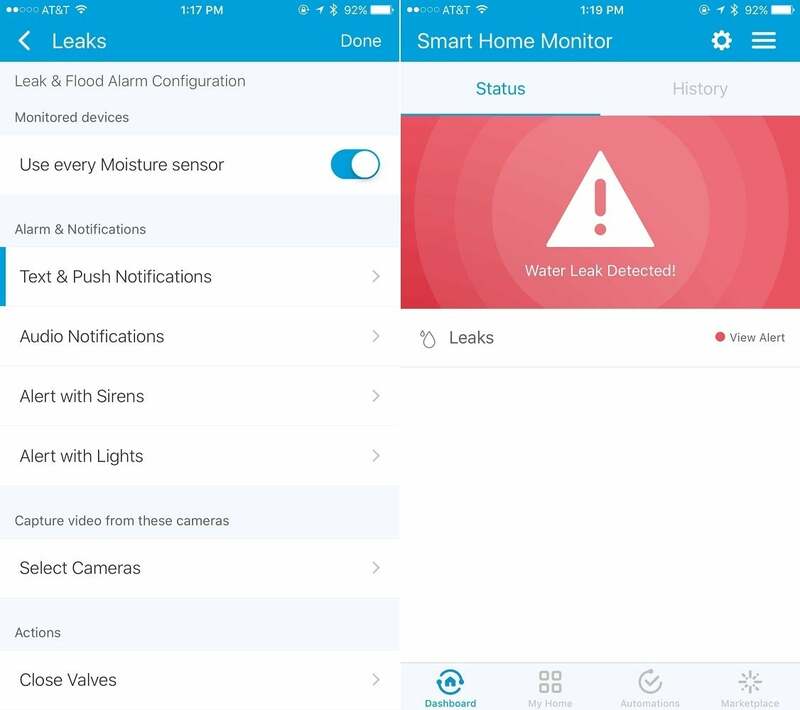 Samsung’s SmartThings Water Leak sensor falls into the latter camp. At $40 per sensor, it’s on the inexpensive side for flood detection. But on its own, it’s also limited in its ability to detect and alert you to hazardous conditions. 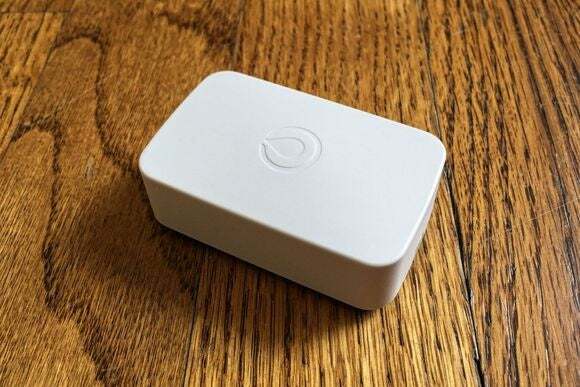 The SmartThings Water Leak sensor requires a $100 SmartThings hub, but once you’ve set that up, pairing the sensor is dead-simple. Pop off the rear cover and remove the plastic tab from the battery, and the sensor enters pairing mode. You then instruct the SmartThings app to find new devices, and the rest happens automatically. By default, SmartThings will send push notifications when the sensor detects water, but you can also plug in a phone number for SMS alerts. 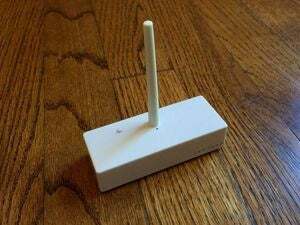 SmartThings’ sensor is among the smallest we’ve tested, at 2.3 inches long by 1.5 inches wide by 0.9 inches thick, but it doesn’t include any extension cables to detect water in tight spaces. You’ll just have to plunk the water sensor down as close to the source as you can. 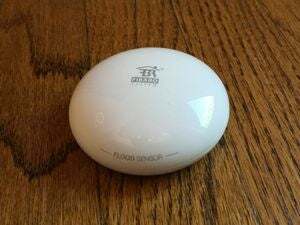 Unlike most smart flood detectors, the SmartThings sensor doesn’t have its own alarm, and the hub doesn’t have one either. That means you’re entirely dependent on alerts from your phone, and you won’t get those if the power goes out. At least the SmartThings platform helps compensate for some of these shortcomings. Through the SmartThings app, you can have the sensor sound an alarm on connected speakers, flash a warning on connected light bulbs, or trigger a water shutoff valve. And in case the SmartThings ecosystem isn’t enough, the platform also integrates with IFTTT. This allows you to set up phone or email alerts, and integrate with other smart home products that SmartThings doesn’t support natively. Samsung’s integrations help make up for a shortage of built-in alert mechanisms. At $100 for a hub and $40 per sensor, the SmartThings Water Sensor isn’t the cheapest solution around. 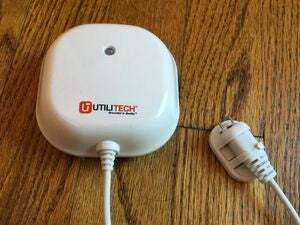 Insteon’s hub costs $80, and sensors usually sell for around $20, while Lowe’s Iris costs $60 for the hub, plus $30 for sensors from Utilitech. Still, if you’re looking for a setup that plays nicely with lots of other connected devices and services, or are attracted to the SmartThings platform in general, Samsung’s name-brand sensor might just be good enough.